The cargo industry is conservative, old school and lacking innovations. This picture has existed for years and has since solidified. But does that correspond to reality? Rather not, measured on the enormous technical and operational innovations that have been made lately which modernized and positively changed the industry. 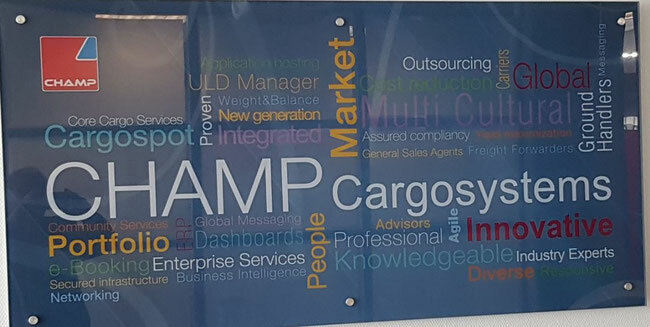 In this exclusive interview with CEO Arnaud Lambert of CHAMP Cargosystems a new game changing example is presented, providing full data access and consignment visibility from A to Z thus ending the black box status of freight shipments. CFG: Mr Lambert, your stakeholder SITA in cooperation with Airbus provides among other things WiFi on board passenger aircraft, for both crews and travelers. Our information is that CHAMP intends taking the next step by connecting the lower decks of passenger aircraft with this technical mode. What’s behind the connected bellies and who benefits? AL: SITA has indeed partnered initially with Airbus to provide mobile and WiFi connectivity on board of aircraft. Today SITAONAir (www.sitaonair.aero) is providing a wide range of services under the umbrella “unlocking connected aircraft value” to Airbus & Boeing aircraft and more. The original focus was on the cockpit and the passengers. Many of us have experienced the usage of WiFi on board and have seen the major improvement over the last 5 years in terms of offering, quality and price. Nowadays it is not uncommon to see passengers connecting to “their” environment (mail, social networks, online gamine, etc.) using only their own laptop or tablet during the flight instead of the on-board entertainment system. 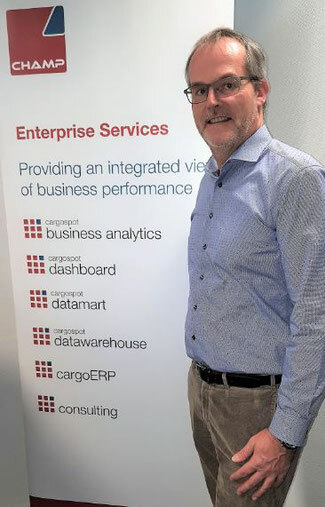 When turning to the air cargo industry, we see an increasing expectation for the ‘always connected cargo’. Shippers have been complaining for years about the non-visibility of their cargo during its shipper-to-consignee journey. Major progress has been made for traceability while on the ground, but as soon as the freight is on board an aircraft, the cargo is not ‘digitally’ reachable. This part needs to be addressed if we want to provide true end-to-end traceability, but it is not only about traceability. It is about digital connectivity which open new horizons. The latest generation aircraft are being monitored in real-time during their flight, driving a lot of value in preventive maintenance, safety, aircraft improvements, etc. Why can’t we do the same with the cargo and derive new value for the logistic chain? Sounds like precious cargo, live animals, pharma consignments, perishables, and dangerous goods would be the ones benefitting most from a constant online connectivity throughout their journey, correct? AL: Absolutely. 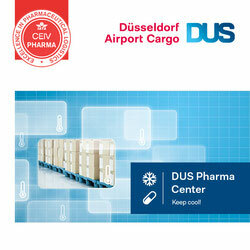 Think about a pharma shipment going out of its temperature range during the flight despite the automatic built-in cooling system of its container. What if you could be alerted when it is about to deviate from its authorized temperature and what if you could remotely activate the manual cooling or send a procedure to the crew to protect the shipment? Not only would the shipment not be wasted but also the original customer promise would be fulfilled. This is a game changer for the service of this industry. Another example of this are live animal shipments. According to IATA, over 200 horses per day are flying the world. Race horses are worth 5-25 million USD each. They are subject to stress during the flight and it can drastically affect their ‘fit for purpose’ at their destination, be it for race or reproduction. Online monitoring of their key health features, including stress levels during flight can not only be a great help for the accompanying groom but also provide essential information for the team taking care of the horse at its destination, or for the coach ahead of the race. At CHAMP we are convinced about the need for cargo online services throughout the cargo journey, and a part of that journey is on the aircraft! Without this part, we will be missing a vital segment of the online logistic chain. 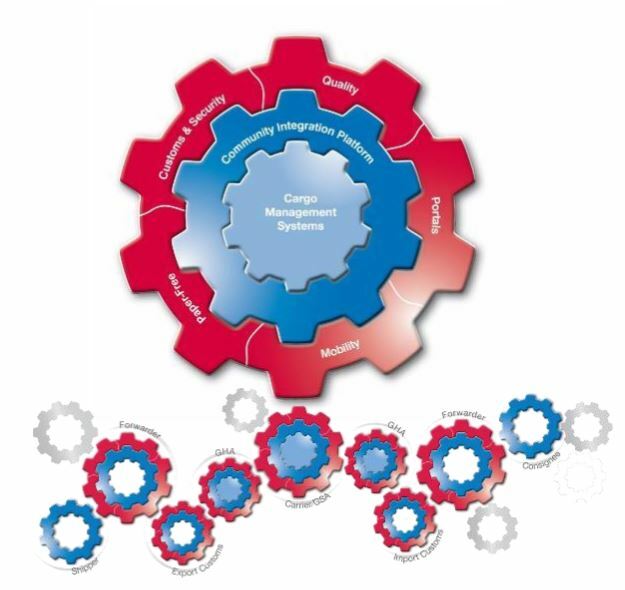 Was the highly integrated automotive industry role a model for your upcoming belly hold connectivity? AL: The automotive industry is an excellent example of operational excellence with deep integration of suppliers and a pioneering approach in lean management. Being able to transfer this approach to the air cargo industry and to offer shippers the ability to eliminate waste as early as possible in the supply chain while getting the data to drive operational excellence will be a major achievement of such an initiative. Following the WiFi implementation in the cargo compartments of passenger jetliners are you targeting freighter main decks as well? AL: Half of the freight moves on freighters and most of the freighter’s volume is main deck. The two tracks are being developed in parallel. The first step is indeed to extend the reach of the WiFi infrastructure already installed on board passenger aircraft to the aircraft belly. In parallel, we are discussing with customers, aircraft manufacturers and infrastructure providers the benefit of the use for special cargo like we already spoke about regarding live animals, pharma or dangerous goods. Sounds like CHAMPS’ upcoming new communications channel might end the barcoding era in air freight, including RFID tags. Or is your WiFi offering rather an amendment to the common barcode system? AL: Barcode took decades to be fully implemented worldwide in the logistics chain and it is still rare to witness fully successful interoperability in the way they have be deployed as, for examples, parcels receive many barcodes throughout their journey. The implementation started with the 2D bar code, then the 3D barcode, but these are still passive identifications and the bar code needs to be visible to be read. This is a major challenge when you want to reach piece level identification on a pallet while ensuring high operational performance. The opportunity of putting in place such a new system will be to leverage the lessons learned in the past and to offer open standards to the industry enabling inter-operability at the hardware and software level, thus allowing the data to flow efficiently in both direction along the supply chain while ensuring they can be accessed by only those who are entitled. Moreover, such a system will need to be future proof and to be equipped with the proper mechanisms enabling smart cargo and smart equipment tomorrow. We can imagine that in the not so distant future ULD should be able to communicate and pro-actively re-route themselves physically to avoid congested areas, optimize asset usages, etc. The communication mechanisms put in place today should not be a limitation for the usages of tomorrow. It is said that once your scheme is working it will enable two-way communication, not only receiving but also actively sending information. Is a transmitter attached to the shipments? And if so, supposedly at ULD level and not to each individual package. Please illustrate and specify. AL: The next generation of tags can transmit, receive, store and process information, meaning that the information they contain can be enriched during the journey and all the necessary information can then travel with the physical shipment. Today tags are mainly attached to ULDs; this is only the first stage. eCommerce is a growing volume in air cargo and requires that we manage the supply chain at the piece level. More and more customs and security require piece level management. Currently, what is available is only one-way communication from shipment to the outside world. We are working on a two-way communication, from and to the shipment. A practical example? A horse in its stall would have a tag on it to measure the animal’s stress level, temperature, etc. In the stall another tag would connect to a specific light that could be switched on and dimmed at the right intensity and colour in order to reduce the animal’s stress level or broadcast the calming voice of the groom taking care of the horse. How does the coordination between ground handlers, carriers and forwarding agents work during installation and practical use of your connected cargo compartments? Anybody in the lead? AL: Clearly everybody plays a role, but the tag is installed on the freight directly at the shipping location at the start of the journey. This ensures traceability from the production line to the end shelf. After this, it will be ‘online’ by leveraging an existing radio communication infrastructure (WiFi/Bluetooth) in a truck, in a warehouse, at the ramp, in the aircraft, etc. At the container level, the container would typically be fitted with a GSM unit to ensure connectivity when nothing is available. What about security? Transmitting data during flights could affect cockpit instruments. How do you prevent distortions? AL: The latest generation tags are transmitting at very low emission power. To be approved on-board they must be certified and will connect to a certified infrastructure to ensure full compatibility and non-intrusiveness with the flight instruments. In our case, the tags connect to the same WiFi infrastructure as the one you use to connect your tablet to the WiFi of that flight. Moreover, to maximize security an aircraft would typically have 4 separate networks: a cockpit network for the flight crew, a flight attendants’ network to manage the passenger cabin, a passenger network for the passengers to connect, and a cargo network to connect the cargo tags. 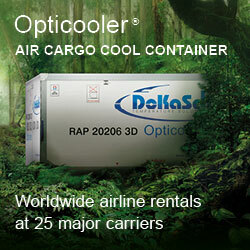 This would prevent any communication between the passengers and the aircraft equipment or with the freight. Security of the information present on the shipment tag itself and its accessibility to the relevant stakeholder in real-time and in a temper proof fashion is another important dimension that we are currently working on, levering existing and proven solution, as this issue is not limited to just this industry. Data sharing needs to be secure and trusted so that it is used. When do you intend to kick off the new WiFi world of electronic communication in the lower decks of passenger aircraft? Any timeframe? And which ULDs, containing what kind of products, will initially be equipped with a transponder? We are currently finalizing the proof of concept in labs for various cargo products types. We aim for the first real live test flight at the end of the year. Prior to West Atlantic Sweden’s decision, the system was thoroughly demonstrated to the operator, delivered and implemented within a time frame of four weeks, emphasizes CHAMP.